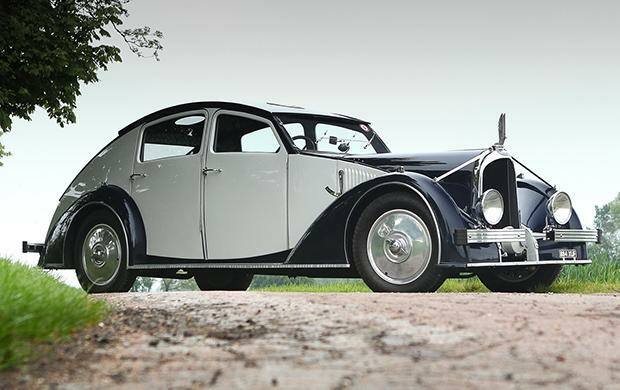 The 1935 Avions Voisin C25 Aérodyne was designed by Gabriel Voisin of France. Voisin had a background in designing various types of aircraft. The Avions Voisin C25 Aérodyne has an interesting design style that is a cross between art deco, aircraft and flamboyance. This four door car appears larger from the outside than it does on the inside. It can hold five people, however, it is a pretty tight fit. The car seats are covered with patterned upholstery of woven cloth. The steering wheel is very large and the instrument panel is filled with an array of switches, gauges, dials and buttons. The back of the Aérodyne is sloped and has a trunk. If more trunk room is needed the rear seats can be folded forward to accommodate for that. On the roof is a sliding panel that can be raised and lowered using a pneumatic motor that’s in the trunk. There is also a crank provided to operate the ‘sunroof’ in the event the pneumatic motor stops working. An interesting feature on the roof of the car are four portholes that allowed light to come into the vehicle. Under the hood of the 1935 Avions Voisin C25 Aérodyne is a 3-liter inline, 6-cylinder engine that puts out about 90 horsepower and the 4-wheel drum brakes are vacuum-assisted. The car has a maximum speed of approximately 85 miles per hour.